With just over one year until Michelle Darnell hits theaters, Entertainment Weekly has released the first photo from the Universal Pictures comedy. The sneak peek image gives us a look at Melissa McCarthy as the title character and Kristen Bell as her assistant. Melissa McCarthy's husband Ben Falcone directs from a script they both wrote, based on a character she created 10 years ago at the Groundlings sketch comedy theater in Los Angeles. Here's what Melissa McCarthy had to say about the title character. "Michelle clawed for everything she had, and she did not do it in the most karmic way." The story centers on Darnell, who is just emerging from prison after serving time for insider training. She tries to re-brand herself, with the help of Kristen Bell's character. As you can see in the photo, they have recruited a "Daisy troop" to sell homemade brownies, which leans on the fact that the Daisies are essentially free laborers. However, Melissa McCarthy reveals that these young girls are not exactly pushovers. "This is not a sweet, shiny group of girls. They're kind of like young thugs." The supporting cast includes Peter Dinklage and Kathy Bates, with Universal Pictures setting an April 8, 2016 release date. Check out the photo below, and stay tuned for more on Michelle Darnell. 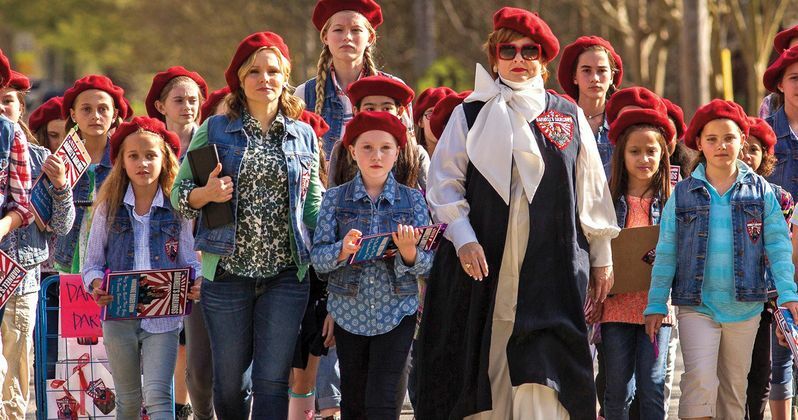 Do you think this could be Melissa McCarthy's next big comedy hit? Let us know what you think below.